From headwater boulder bouncing to casting from drift-boat decks—when the deep wade is a non-essential element, put a premium on comfort and slip into Simms’ G3 Guide Pants. Pant advantages start with 25-percent more breathable 5-layer GORE-TEX® Pro Shell fabric, intuitively tailored to bolster mobility, breathability, and durability where it matters most. 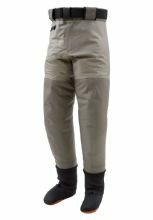 Patented front and back leg seams deliver an articulated fit for enhanced comfort and durability, while the new waistband construction features integrated loops housing a 2-inch elastic belt and accented with a Simms Trout buckle. Stash keys and wallets in the water-resistant zippered right hand pocket and seek convenient anytime-anywhere relief via a YKK® AQUASEAL® waterproof fly. SIZES: S, SK, M, MS, MK, ML, L(9-11), LS, LK, LL(9-11), XL, XLK, XLL, XXL Click the Size Chart above right for measurements.